Please find below some of our Morocco trekking tours and travel reviews form our valuable guests. We had the pleasure of meeting Ibrahim and his crew (Mohammed and the mule :)) for a fantastic 2-day trek. The view along the trek was amazing and our great guide made it even more memorable by telling us stories about the places and the berber people living there. We highly recommend atlas trek shop for all who want to have a great experience in the atlas mountains. We did not intend to go higher than Imlil, and we had one night at Dar Adra with gentle walks either side. Ibrahim was a charming and very helpful guide, not forgetting the driver, Hussain. Some of the driving was along single track mountain roads on blind bends, with no barrier, just scree at the edge of the road and a very long drop. I am a nervous passenger at the best of times, but Hussain was a very careful and very skilled driver and we had total confidence in him. I just have to thank Mohamed and all the guys that followed us during the trip for their very high professionality, expecially regarding the way the guide followed us for the whole 3 days, in every single moment. We had the option to do a very exciting 3 days trekking from Imlil to the Toubkal peak and I just have to say that apart the strong impression of being in the "right hands", all the team has always been extremely kind and always available in meeting our requests. The guide adjuste the pace of the walk according to our conditions and gave us every moment useful tips to approach in the best way our trekking. I have to thank you one more all the guys involved. We had a fantastic 5 day trek round the Berber villages with Aztat tours. The walks consisted of 12 - 15km with a climb of approx 600m each day. We especially liked the first few days when we were off the Toukbal trail and had the mountains with their spectacular views to ourselves. Ibrahim our guide was excellent company; very friendly and so patient with my slow pace on the uphills. The overnight gites were basic, but had mattresses and plenty of blankets to keep out the cold and showers/hot water available for washing. The stars were amazing. The villages were fascinating and Ibrahim was happy to be pelted with questions about people's lifestyles. Ibrahim our cook made us the best food we had in Morocco - loads of fresh salad and lentil stews - including hot lunches on top of mountains, served whilst you sat on cushions and admired the view! I have never felt so well looked after on a walking holiday. “Larson was a very friendly and cheerful guide who looked after us really well. Samir produced fantastic vegetarian food which was delicious and extremely welcome. We were delighted with the refuge on the first night which was exceptionally clean. This trek was a wonderful experience and we were overwhelmed with the stunning views, and very pleased to have managed to summit Toubkal. Our thanks to the guides”. Looking for a local organization for a tailor made trip (a multi-day trekking tour and a round trip) we have sent Mohammed an email with our ideas. Very quikly Mohammed answered and gave us feeedback and new possiblities. After a few emails we had a good idea for a nice journey. It was a fantastic, very well organized trip. A beautiful trekking, with excellent guide and cook. Later during the tour we had a very good, safe driver. What we really appreciated to Mohammad was that we were able to ask questions and he always replied with the good and honest solutions. Thank you very much Mohammed and staff! We have just returned to Canada and I wanted to take this opportunity to provide some fedback about our two day trek. While it was physically demanding for me (especially the first day), it was an absoloutely fantastic experience, and a highlight of our 3 week trip to Morocco! The trek was so well organized and professionally run. You were prompt and thorough in your email replies prior to the trek and everything was ready and available as described when we arrived in Imlil. Dealing directly with you and supporting a local Moroccan company was a great choice! Adil was an excellent guide. He was knowledgeable, warm and friendly. He was encouraging and patient, especially when I needed to stop and rest frequently on the uphill sections. Ali's cooking was wonderful. Of all the meals we'd eaten in Morocco, his were the most flavourful!! The quantities and variety were very generous. And of course the scenery was spectacular! What a thrill to be in the midst of those stunning mountains, valleys and villages. While we were a bit unlucky with the weather on the second day, walking through the clouds and cold, heavy mist was also a memorable experience. The acommodation in the village guest house was very basic but adequate. We appreciated being warm, dry and well-fed. In terms of the grading of difficulty of the trek, I guess those ratings are relative, based on the range of local terrain and personal level of fitness. To my mind, an "easy" grading would be mostly flat on solid terrain. This trek, both the extened uphill sections and even the downhill portions on loose stones, seemed much more like "moderate" for me. It was a challenge for me (my husband was fine), but to be in the High Atlas and accomplish the hike was an exhilarating experience! I'd like to thank you and your team for a wonderful two-day trek. We will recommend you to all our friends. Please feel free to use this feedback in any way to promote your company. We wish you all the best! thank you so very much for the wonderful experience offered by Atlas Trekking on my recent trip to summit Toubkal. Your package was very well run, and I was very impressed by the guide Mohammed, and the full climb experience . 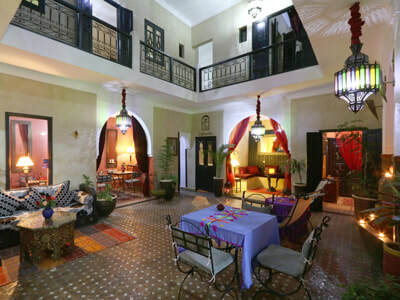 I must say the stay at your guest house at Dar Adrar was excellent – very relaxing and the food was very tasty! All in all a wonderful experience and one I shall be recommending to my friends and colleagues. Please give my best regards to your business partner, Jamal, who took me back to marrakech. I discussed the Sahara trip with him and I will be doing this with you later this year. Just wanted to say again that we really enjoyed the trip that you organised for us. The trekking was perfectly matched to our needs and was expertly and professionally led by Abdul. I very much appreciated the help Abdul gave me in using crampons for the first time. He was patient and understanding and gave me the confidence to make good progress over the snow. The cook and muleteers made up a great team. The food they prepared was very appetising and wholesome; they did a great job! We enjoyed the range of accommodation you arranged - from the most basic gites to the hotels (especially Chez Pierre). The drive to the desert and back gave us a fascinating insight to Morocco and our time in Marrakesh was a great way to end the holiday. My wife and I have already talked about asking you to arrange a walking holiday for us, perhaps next year. I'll be in contact in due course. Thanks again for an excellent holiday and I look forward to hopefully seeing you in Morocco again before too long. Thanks for a memorable trip. We had a great time with Ibrahim, Ibrahim 2, Mohamed the cook. We learned a lot about your mountains. Ibrahim sang some Berber songs for us and showed us berber dance moves. He has a future in the movies! I trust the balance I owed you has been received. We look forward to visiting again and telling our friends about the perfect arrangements you made for us. We are writing to you to thank you for your kindness and seriousness in booking our day trip to to Ouzoud Waterfalls. We are very impressed with its majestic beauty and the beauty of your entire country. But most of all we are writing to give compliments on our tour guide, Adil and his driver. Adil was punctual to pick us up in our hotel. He was so knowledgeable, responsible, friendly and kind to us throughout the entire trip. He took care of us and answered all of our questions with grace. The food we had was delicious, honestly we didn't have a better tagine anywhere else than the place that Adil picked for us to have lunch at! It was such a pleasure to have him as our guide. We'd like to send to him and to you our best regards and we hope to go back to Marrakech soon and book another excursion with your company and of course, with Adil as our tour guide. Inshallah! We have just come back from a 5 day hike in the Atlas Mountains with Aztat treks which was excellent. We enjoyed everything about it from the trekking, the company, the food and the organisation. Well done Mohamed thank you. My friends and I had a wonderful trekking trip organised by Mohamed and his team . We hiked from Imlil to Toubkal and back, over an extended trail, rather than the one straight up and down the valley. The views were stunning and the level of difficulty was just right. The team from Aztat were professional and attentive. They took great care of us and made sure we had lots of fun. The food was really delicious, the gites and refuges along the way were in good condition and well chosen. The pricing was very reasonable. In short, I would highly recommend a trekking trip with Mohamed Aztat. Impeccable organization and personalized itinery, excellent guide and support. 3 days in the valleys and 3 days above the snowline, including four 4000 metre peaks (obviously we had to include Toubkal!). Well judged support (trek was appropriate for our abilities - challenging but not too challenging) and very trustworthy, I have no hesitation in recommending Mohamed Aztat and his associates. His guesthouse in Imlil is pleasant with hot water and regular mint teas, with great views across the valley. We took a three day trek from Imlil, staying in gites overnight. Arranging the walk was easy, Mohammed answered all questions promptly and matched the walk exactly to our wishes. The transfer from Marrakech arrived almost to the minute on time and we were greeted in Imlil very professionally and care was taken that we had the right equipment and supplies with us. The guide, Brahim, and the mule driver Samir, were excellent. The food throughout was prepared beautifully and we ate really well on food prepared on a single portable gas ring. The gites overnight were of course very simple, but clean and comfortable enough. Mohamed Aztat organised an excellent trip. We were led by our expert guide through ever changing scenery from lush valleys to high mountain passes and then safely to remote Berber villages to spend the night. Our cook prepared delicious, generous traditional meals and our porters made sure that our packs travelled from village to village. The whole trip was perfectly planned and the genuine kindness and generosity of everyone in Mohamed's team made it a tremendously enjoyable experience. Michael R ( April 2012 ). I booked a two day trek to Jebel Toubkal with Mohamed, and have to say that everything worked perfect. The pickup from Marrakech arrived on time and took us to his nice guesthouse in Imlil. We had a nice room with private bath & toilet, and the nice sun deck has wifi. Our guide and muleteer arrived on time next morning, and both were very skilled and provided well for us the next days. Everything went as planned, and we were back in Imlil for lunch two days later and transport back to Marrakech. All meals were good and varied, so all in all a very good experience and good value for money. We just wanted to thank you for the most excellent trip we had in the Atlas mountains as arranged by you last May (2011). Here are some photos of our trip. We will definitely recommend you to all our friends. All our best wishes to you, your family and your work force for 2012.
we are already at home. I would like to thank you for the excellent organization of transfers, trecking and accomodation in Marrakesh. Everything was perfect. I wish you a lot of success in your work in future and maybe sometimes we will meet again. We have just returned from our Moroccan holiday and we all had a wonderful time. The organisation was faultless and the Dar Adrar very welcoming and the staff very helpful. Abdul , our guide, looked after us really well and Ali kept us very well fed! All the trekking was amazing - the views, the villages, the people, the food etc etc. Abdul was very willing to answer our many questions and we really learnt a lot as well as having a wonderful time. Thank you very much for everything and we may well be back! I'd love to thank you for our exellently organised visit to Morocco October 9-14th. Without your hard work our stay wouldn't had be so welcoming and enjoyable. It is really apreciated. Could you give my best regards to your friendly team: mountains guide (Abdul Aziz? ), cook and muleteer; they were very professional and hospitable to us. As we told you, we greatly enjoyed our trekking experience with Aztat Treks and would highly recommend your business to anyone who wished to trek in the High Atlas. Our guide Mohammed, with muleteers Samir and Ali were all delightful company and made the experience more enjoyable. Samir’s food was amongst the best (if not the best) that we had during the rest of our trip in Morocco – especially his spicy lentils! We are now back in England and when I have sorted things out I will email you a photograph of Mohammed our guide for you to give to him if you would be so kind. We have just returned back to Marrakech after our trip with your company, and we wanted to email to say how much we had enjoyed it. The food was some of the best we have had in our entire visit to Morocco, the walk was beautiful, and our guides were very helpful! Please pass this message on to Brahim and Mohamed, we will certainly recommend your company. 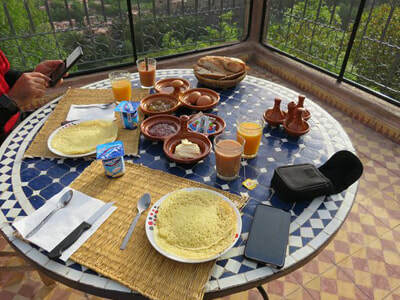 “PLUS, Hire a Berber guide and head out of Marrakech for a trek in the Atlas Mountains... Mohamed is simply the best guide with whom I have walked in Morocco...". “We headed for the hills to speak to a man who spends his days with his head in the clouds. We went live to the Atlas mountains in Morocco, to join one of their top guides Mohamed Aztat.."
“Mohamed Aztat who owns this small guesthouse, is one of the best guides around. He arranges treks, has a good team of guides, muleteers and cooks, as well as a small shop with equipment rental..."
“For proper treks, contact the Atlas superguide Mohamed Aztat (0668 76 01 65, aztat.rando.free.fr ), who can arrange day trips and longer hikes into the mountains, with your transfers from town laid on . 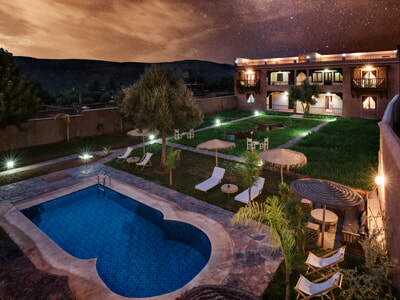 “Dar Adrar is run by one of the star guides of the Atlas, Mohamed Aztat..."
“... In Morocco's mountains There’s solitude high up in the Atlas Mountains – only your guide, your mule and a few excited locals will know you’re there...“Welcome to the happy valley,” said our guide, Mohamed Aztat, when we stepped out into this Arcadian landscape next morning..."